Google street view 360 spheres (both interior and exterior) are viewable from any device (desktop, tablet, mobile, etc), and are housed on Google’s servers (Search, Maps, Google My Business, Goole Earth, etc.) for free. You only invest in having this imagery produced from us as a Google trusted partner. Google Street View for Hotels breeds instant credibility, trust and familiarity which are major conversion ingredients. 5 linked locations (one area) = $399. If you have a larger business cost is only $100 for each 5 added 360 Google street view 360 images. The larger the business the more opportunity you have for consumers to explore your location and become familiar. Most hotels cover the “hero” areas of the hotel like the arrival lobby, pool, banquet area, room types, patios and more. 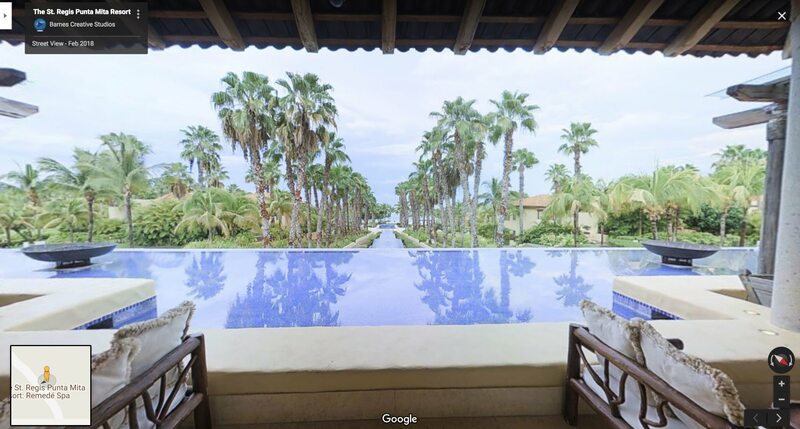 Anything that “sells” your hotel should be on Google Street View for Hotels. Here is an urban example from Kimpton’s Nine Zero Hotel in Boston. Below is a quick video showing you where to look for your tours in street view mode on Google Maps. You own the access and rights to all of these Google street view images that can be used in a myriad of ways from social media to supercharging SEO on your site. We are happy to give guidance on how to best leverage your new virtual tours. Contact us today if you are ready to get started with your property on Google Street View.